The Pierre & Vacances Les Terrasses d'Arcangues Residence overlooks the Arcangues golf course. This neo-Basque style residence has 2 buildings situated around the swimming pool or the garden. Most of the apartments enjoy magnificent views of the golf course and Pyrenees Mountains. The centre of the village with its restaurants is only 200 meters away,where there are also playing courts for the popular Valencian game of Trinquet. Biarritz and Anglet beaches are 7km away and Bidart is 12km away. For your leisure and wellness, the resort offers a large range of activities: - Outdoor pool in the residence complex (open from May-September). - Stunning sandy beaches just a few kilometers from the residence. - The nearby popular golf course of Arcangues. - Arcangues: in the heart of the 'Pays Basque', between the sea and mountains, just minutes from Biarritz. - Overlooks the Arcangues golf course, 200 meters from the centre of the village. - A residence with swimming pool and paddling pool. Living room with 2 single sofa beds, one of which includes a pull-out bed. a bunk bed in the entrance area. Please note: all studios are on the ground floor, for people with reduced mobility. Note: Bed height not suitable for children under 6 years of age. Law no. 95 949 of 25/08/1995. In the heart of the Pyrénées-Atlantiques, Arcangues is a picturesque village surrounded by a golf course. 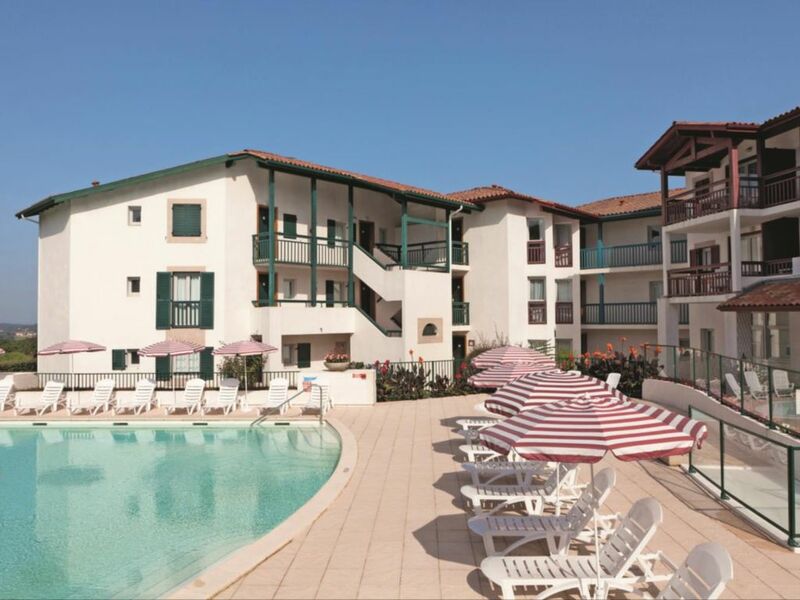 �� 7 kilometres from Biarritz, near Anglet, Hendaye and Saint-Jean-de-Luz. A lively coast, with sandy beaches, wild cliffs and a hinterland in the green mountains. �� *Services proposed only to certain residences; subject to availability.